A fierce defender of the Trump administration and adversary to the federal workforce is poised to become the top Republican on the House’s oversight panel, lawmakers announced this week. The appointment of Rep. Jim Jordan, R-Ohio, promises to make for a divisive two years for the House Oversight and Government Reform Committee, the chamber’s top watchdog of federal agencies and their workforces. Jordan is the most senior Republican on the oversight panel, but until Thursday, Rep. Mark Meadows, R-N.C., who chairs the Government Operations Subcommittee, was considered the most likely candidate to serve as the whole committee’s ranking member. Rep. Trey Gowdy, R-S.C., the current chairman, is retiring at the end of the year, and Meadows ultimately withdrew his name from consideration. Jordan has been one of President Trump’s staunchest advocates in Congress, which could create a tense atmosphere when Democrats take control of the oversight committee. Rep. Elijah Cummings, D-Md., who will chair the panel in the 116th Congress, has promised to significantly ramp up investigations into the Trump administration’s management of federal agencies. Cummings has criticized the current Republican leadership for its failures to issue subpoenas and demand testimony on an array of issues, ranging from the treatment of career employees to implementation of immigration policies. Cummings voiced some optimism that he and Jordan would be able to find common ground. Jordan has defended Trump at virtually every turn, frequently pushing back on criticism at committee hearings and on TV. Meadows, before taking his name out of consideration for the ranking member post, compiled a strategy for pushing back on Cummings’ and House Democrats’ investigations into Trump and his administration, according to documents obtained by Bloomberg. The lawmaker said he would “tactically play the Democrats’ politicized activities to [Republicans’] advantage” by construing the the majority party’s investigations as overly onerous, arguing they were overstepping the role of the legislative branch, and hiring more attorneys and investigators to fight back. Ben Williamson, a spokesman for Meadows, said no decisions have been made on whether the congressman will continue to serve as the top Republican on the Government Operations panel. Rep. Gerry Connolly, D-Va., is set to become its chairman. The oversight committee is also the starting point for most legislation affecting the federal workforce. 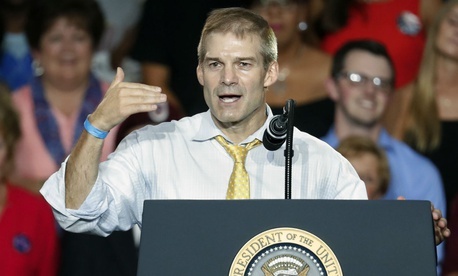 Jordan formerly chaired the Republican Study Committee, where he helped craft legislation that would have imposed five years of pay freezes for federal employees and cut the workforce by 15 percent through attrition and a two-out, one-in policy. He also pushed to apply to the entire federal workforce an increase for new federal employees’ contributions toward their pensions, and was a key architect of the 16-day government shutdown in 2013. Jordan led vigorous oversight of the Obama administration, especially focusing on the Internal Revenue Service. Federal employee advocates who have spoken to committee staff have expressed optimism that they will encounter a friendlier agenda with Democrats at the helm. While Meadows and Jordan are political allies and both members of the conservative House Freedom Caucus, Meadows has taken a softer tone with the federal workforce. He worked across the aisle on issues such as reforming the federal employee 401(k)-style Thrift Savings Plan. Matt Biggs, the secretary treasurer and legislative director at the International Federation of Professional and Technical Engineers, called it “unfortunate” that Republicans did not choose someone with more of a history of bipartisanship. “While IFPTE will hold out hope that Rep. Jordan will put partisanship aside and work in a good faith manner with the Committee’s majority to the benefit of taxpayers and federal workers alike, his history suggests otherwise,” Biggs said.